VATICAN CITY (CNS) — Popes are elected by members of the College of Cardinals, not by the general Catholic population and certainly not by the media. Yet Cardinal Timothy M. Dolan’s presence on practically every journalist’s list of potential next popes bespeaks a real and important influence among his peers. The most obvious reason is the New York archbishop’s ebullient, extroverted personality and quick, frequently self-deprecating wit — traits that forcefully contrast with the formality typically associated with princes of the church, but which visibly charmed other participants at the February 2012 consistory at which Pope Benedict XVI made him a cardinal. No doubt there are churchmen in Rome and elsewhere who find the cardinal’s style disconcerting in someone who will help choose the successor of St. Peter — and who could even assume that role himself. He is almost certainly the first cardinal to downplay expectations of his election as pope by saying that they must have been induced by “smoking marijuana.” Yet such quips are no more shocking than Blessed John XXIII’s frequent jokes and references to his peasant background were in his time. Cardinal Dolan has never worked in the Roman Curia, the church’s central administration at the Vatican, but he spent seven years as rector of the Pontifical North American College, the American seminary in Rome, when he also taught at two of the city’s pontifical universities. His earlier service at the apostolic nunciature in Washington, D.C., exposed him to the Vatican diplomatic corps, the primary channel of communication between local bishops and the Holy See. 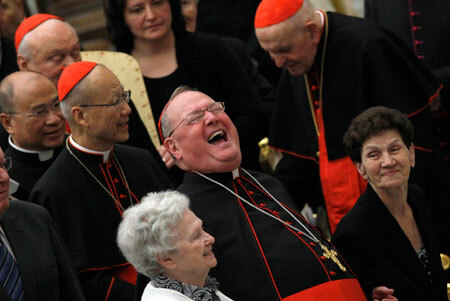 Judging by the conventional wisdom, the cardinal’s single biggest weakness ought to be his nationality. Americans have long been deemed ineligible for the papacy, lest the leadership of the church appear to be linked with the United States’ economic and geopolitical dominance. But there is reason to think that this prejudice has diminished. For one thing, after more than a decade of waging two costly wars in Afghanistan and Iraq, and considering the rise of China, the U.S. is now something of a humbled hegemon. Even more significant is the changed relationship between the Catholic Church and large parts of American society. As secularization spreads even in their traditionally religious country, U.S. bishops have become an ever stronger source of protest and resistance against what they warn are encroachments on religious liberty. As president of the U.S. Conference of Catholic Bishops and archbishop in the country’s largest media market, Cardinal Dolan is effectively the leader of that resistance, which he has waged with characteristic good humor, so that even his opponents find it hard to cast him as an enemy. If other cardinals once viewed Americans with a certain wariness, as potential carriers of modernist heresies or Protestant-influenced ecclesiology, they are now more likely to see them as defenders of the faith on one of its consequential battlefields with secularism. As Cardinal Dolan joins those who will choose the next pope, his record in that struggle is probably his most important credential. Born in St. Louis Feb. 6, 1950, Timothy Dolan attended St. Louis Preparatory Seminary and Cardinal Glennon College, where he earned a bachelor’s degree in philosophy. He finished his studies at the Pontifical North American College in Rome and the Pontifical University of St. Thomas, earning a licentiate in sacred theology. Ordained in 1976, he spent his early years as priest going back and forth from parish ministry in St. Louis and studies and work in Washington, earning a doctorate in American church history from The Catholic University of America and spending five years as secretary at the apostolic nunciature. He was vice rector of Kenrick-Glennon Seminary in St. Louis for two years and rector of the North American College before being named auxiliary bishop of St. Louis in 2001. One year later he was appointed archbishop of Milwaukee. He was named archbishop of New York in 2009. 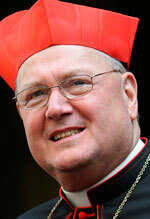 One year later he was elected president of the U.S. Conference of Catholic Bishops, and in 2012 he was named a cardinal. He has served as chairman of the board of Catholic Relief Services and is currently a member of the board of trustees of The Catholic University of America and a member of the pontifical councils for Promoting New Evangelization and for Social Communications.